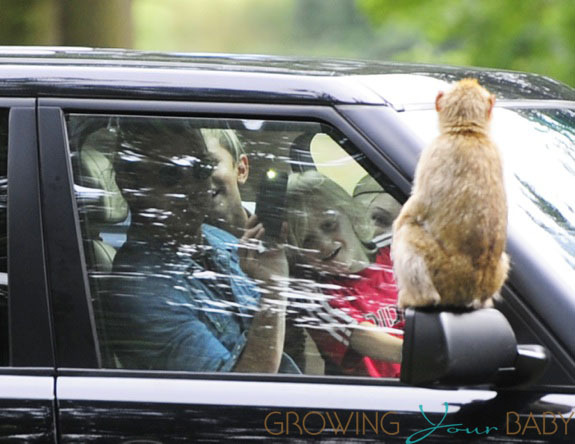 Gwen Stefani and Gavin Rossdale were spotted spending the day at the Woburn Safari Park in Bedfordshire, UK with their boys Kingston and Zuma on Wednesday. The rocker family started their adventure on the road safari getting close to rhinos and lion before letting a pata monkey sit on their mirror. Afterwards Kingston and Gavin navigated the ropes course before the group grabbed a quick bite. The couple, who split their time between Los Angeles and London, have been busy recording and touring. Gavin’s band Bush, who has been on tour since April, just wrapped their last date on July 27 in Austria. Gwen is reportedly back in the studio with her band No Doubt recording the band’s 7th album. Despite their crazy schedules, the family is always photographed out together at the park, the beach or riding bikes.